Black cherry is a handsome tree bearing black fruits. It is a native of North America. It is common throughout eastern North America, from southern Canada to central Florida, and west to Minnesota and eastern Texas. It also occurs naturally in higher elevations in New Mexico and Arizona, and south through Mexico to Guatemala. 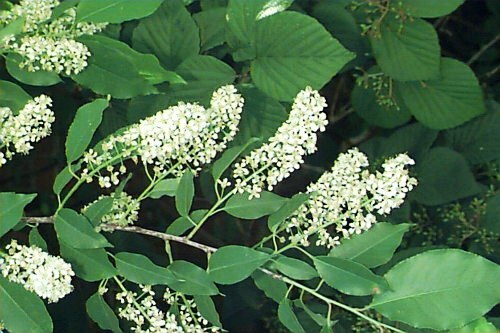 Leaves alternate, oval to lance shaped, shiny dark green, 5.1-15.2 cm long, margin finely toothed, apex sharp pointed, green but turning yellow and finally red at the end of season; when crushed, the leaves smell like black cherry soda pop. Flowers white, tiny, borne abundantly in elongated drooping clusters, 10.2-15.2 cm long. Fruits dark red, almost black, about 0.8 cm in diameter, ripening in early summer; thin skinned and juicy, but usually somewhat bitter tasting. Black cherry can be multiplied by seed. The seeds require 3-4 months of chilling to germinate. Superior selections are propagated from soft wood cuttings in spring. 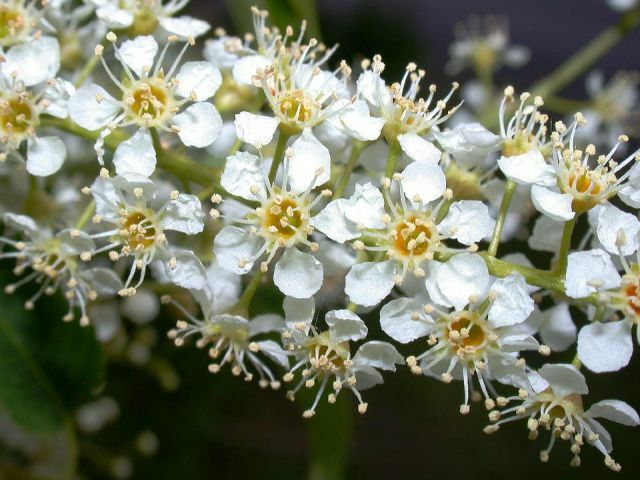 Black cherry grows best on moist, fertile soils, but can be found in just about any forest, along any roadside, or in any abandoned field within its range. The seeds are spread by birds, so black cherry is often abundant under utility wires along highways, and along fence rows. Although it sometimes occurs in pure stands, black cherry is usually a component of mixed forests and weedy hedge rows. Black cherry grows fast and is quite long lived. 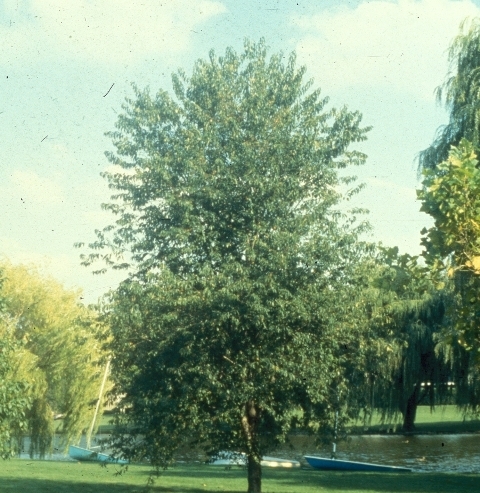 In spring, black cherry trees are often disfigured by tent caterpillars, but these usually do no long term harm, and are themselves eaten by yellow-billed cuckoos, great crested flycatchers and other native songbirds. These small fruits mature during summer and fall. These turn red and then dark purple and then finally black. These are edible and taste somewhat bitter. Therefore these are not eaten fresh. The fruit is however suitable and used for making jams, jellies, and cherry pies, liquor and wine. These are also used to flavor brandy. Brandy or rum flavored with black cherries is called “cherry bounce.” They are also a popular flavoring for sodas and used in many ice creams. 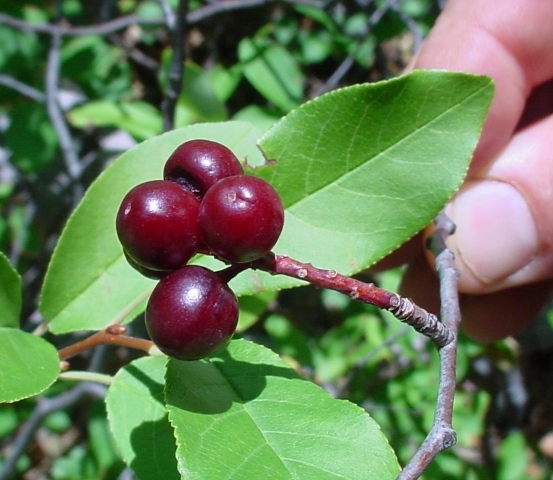 The leaves and inner bark of black cherry contain a cyanide compound that smells like almonds and was formerly used in cough medicines and liniments. The wood is reddish brown, close grained and very hard. It is used for furniture, veneer; tool handles, and has few rivals as a fine cabinet wood.